The mere act of combining the simplest ingredients and kneading them together with your very own hands will set off a chain of magical chemical reactions. As you work your way through the combined mess of ingredients, kneading and stretching repeatedly, will magically transform something shaggy and ugly to something as smooth and soft as a baby's bottom. It is also about the mysterious actions of yeast coming to live, releasing carbon dioxide as it starts feasting on the sugars, causing the dough to rise and expand, all happening under a warm and comfortable environment. The aroma of bread baking in the oven...the moment of satisfaction when a freshly baked loaf emerges from the oven...makes me feel that all the extra effort is worth it. It is such a wonderful and rewarding experience only those who have walked through the entire process would be able to appreciate and enjoy their fruits of labour. I guess, partly because of my repeated failures, I am constantly lured to make the next loaf, again and again. I probably won't give up until one day I am able to churn out a satisfactory loaf from my kitchen. Stir bread flour, caster sugar, salt, milk powder and instant yeast in a mixing bowl. Make a well in the centre, add in mashed banana, fresh milk and egg. Reserve about 30ml of water and add the rest into the mixing bowl. Mix the ingredients with hand and slowly form into a rough dough. Add in a little of the reserved water if the mixture is too dry. Transfer dough to a lightly floured work surface. Knead the dough till smooth. Add in the reserved water a little at a time, knead well after each addition. (This way, the dough will not be too wet and sticky). Use up all the reserved water. The whole process should take about 10mins. When the dough is smooth, knead in the butter. Continue to knead the dough until it no longer sticks to your hand, becomes smooth and elastic. This should take about another 20 mins. Do the window pane test: pinch a piece of the dough, pull and stretch it. It should be elastic, and can be pulled away into a thin membrane without tearing/breaking apart easily. Place each dough in lightly greased (use vegetable oil or butter) mixing bowl, cover with cling wrap and let proof in room temperature (around 28 to 30 degC) for about 50mins to 1 hour, or until double in bulk. Remove the dough from the bowl and give a few light kneading to press out the gas. Divide dough into two equal portions. Roll into rounds. Cover with a damp cloth or cling wrap and let the doughs rest for 25mins. On a lightly floured work surface, flatten each dough into a round disc, roll the dough from the centre to the edges until the diameter is about 9". 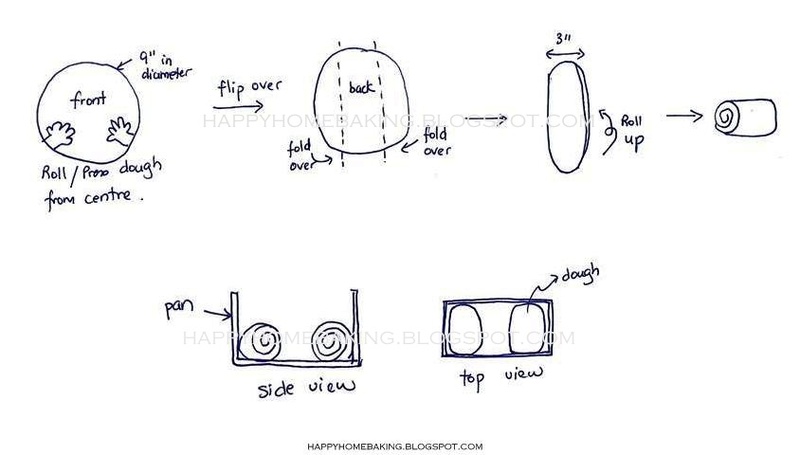 Flip the dough over. Fold the dough 1/3 from the left side towards the centre. Fold over 1/3 from the right side, to form a long rectangle (about 9" x 3"). Starting from the shorter end roll up swiss-roll style. Pinch and seal the seams. Place the two doughs, seam side down, in a well greased pullman tin. (See illustrations below). Cover with damp cloth or cling wrap and leave doughs to proof for the second time for about 55mins (at temperature 32 degC) or when the dough has almost reached the rim of the tin. Brush with egg wash.
Bake in pre-heated oven at 180 deg C for 40 mins or until golden brown. Cover with a foil if the top browns too quickly. Remove from oven, unmold immediately and let cool completely before slicing. Once cooled, store immediately in air-tight container. Is there anything wrong with it? To me, it looks good enough to eat. Seems like you are also a Nutella eater like my son. He slapped on his nutella as thick as the bread. Terrible isn't it? the loaf looks very good, can see is soft from the photo. Hi, when i c your illustrations, this reminds me the "chef in Black" cooking show :o) He used to sketch like that. I know exactly how magic and addictive bread making can be! It's so labourious but completely worth it! Really admire your passion on making bread and your hand written recipes really impress! I don't know what went wrong with the bread, but it seems quite nice and it's perfect for me. May be just lack of the banana taste but I think the softness of the bread would be the most satisfaction one! Love this banana loaf...so soft and fluffy. Just what I need for a breakfast toast! Edith, the bread tasted soft and delicious, just that I won't consider I have done a good job. We love nutella, and I like baking with nutella too! Jess, yes the bread stayed soft for 2 days. eatandbehappy, my kids couldn't understand what I was writing too! FL Mom, I did use a well ripened banana, maybe the amount is not that much as compared to the amount of flour and the other ingredients. I have never thought of using vanilla in bread making, thanks for the tips :) I wish I can bake you a loaf when I finally get there! Baking Fiend, it was done sometime back, when a reader asked me what I meant, so I drew the illustration and posted up in that post. Bee Bee, too bad my bread machine broke down, if not I should be able to conduct more experiments! quizzine, glad you understand what I was trying to convey. I admire your inspiration & persistency in perfecting your skills HHB. I think you made the nicest bread around. I know i will turn to your blog anytime i'm in for bread making. I love the organised & detailed notes. Thank you for your inspiration. Keep up your good work! Your children are the luckiest one enjoying mummy's home-made bread bake with love. It looks like delicious bread. Its so much paler and prettier than normal banana bread. Looks like you could even use it for a sweet sandwich. I like your sketch,so clear for illustration. My first baked of loaf bread was not so successful. I might try your way. Thanks for sharings. I'm sure yours is far more better than those! I love how neat your handwriting is! 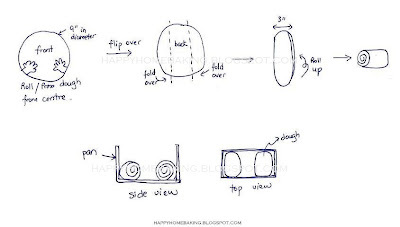 And the diagrams are adorable too :) I can't see anything wrong with your loaf though. Looks perfect to me! 丟人現眼？I think your mandarin handwriting are so neat and nice. You should have seen mine, but don't think you will have any chance. I really love the recipes that you post!! They always end up being delicious! =] I've just begun to start copying down recipes in a notebook like you.. hehe. I really admire u, i wanna be a good baker and mommy like u!! (i'm 14) I'm forever waiting for u to post more recipes, and reading about ur life is very interesting!! now i'm waiting for the outcome. and i change a esbit ingredient on the flour..i use three types, high protein 120g, whole wheat flour/ATTA 80g and super fine flour 100g.. hoping the result will be as good as yours..
is me again,HHB.just now i gently press it did bounce back is it mean the bread is soft? but the holes on the crumb doesn't appear to be evenly spaced out like yours.i have to wait until tomorrow to see the softness still the same. Hi Janetan, whole wheat flour will make the dough dry, so you will need to adjust the liquid amount otherwise the bread will be on the dry side?? You have also reduced the high protein flour to less than half of the original recipe, so I am not sure whether the final texture will be affected. Bread flour or high protein flour is required in bread making to give volume and better texture. I think besides touching, you need to taste it to see whether it is soft. When freshly baked, this bread will be as soft as those store-bought bread loaf. Store it in airtight container and it should be able to keep well for up to 3 days. oh my god, just like u said, the bread is dry but the taste is good..so i steam the bread before i eat it..i change the measurement of the flour and flour's type because my high protein is not enough..i though the dryness is because i didn't knead enough in my kitchen aid mixer (i knead for 5 minutes after i added butter). what do u think? should i knead longer and how long? ?